Students from all walks of life, traditional college-aged students, and working adults, find themselves managing school and degree aspirations with other commitments like family or full or part time work. For this reason, more students today turn to online learning as a viable and respected means for earning their degree fully or partially online, or as a way to obtain professional training to further their careers. If fact, because the demand is so high, the number of fully online degrees offered by accredited and highly respected universities across the nation is increasing annually and today students can obtain degrees from the associate to doctorate levels from most major colleges and universities across the nation. 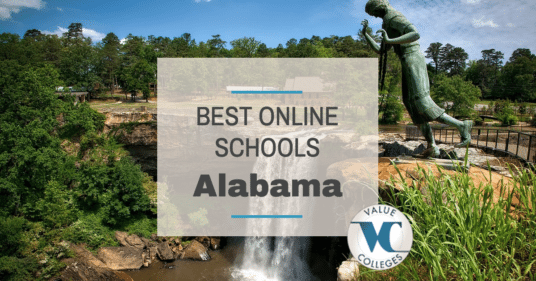 Value Colleges strives to bring you the best of the best, and in this Top 10 list you’ll find colleges and universities located in the state of Alabama that offer the state’s top online programs. Each institution listed meets Value Colleges Best Value Credentials with a solid ROI plus institutional regional or national accreditation. Please note that the annual tuition prices listed actually reflect the national IPEDs data since oftentimes online degree costs can vary. Each school listed also offers degrees that students can obtain 100% online and includes options for associates, bachelors, masters, doctorate or continuing education degrees. Troy University was founded on February 26, 1887 as Troy State Normal School and has since built a strong tradition of teaching excellence in the state of Alabama. The school originally trained teachers to lead students in the Alabama school system but today Troy State College has four campuses in Troy, Montgomery, Dothan, and Phoenix City, plus the online college. The university is known across the state and nation for offering high-quality, affordable academic programs to traditional students and working adults. Troy University online offers a number of fully and partially online, fully accredited undergraduate and graduate degree programs to residents of Alabama and beyond. The school is proudly known for offering the same high-quality learning experiences online as are found in the on-campus experiences. Coursework is accessible and student services like advisement, library access, and communications with qualified faculty makes ease of learning a key component to obtaining a degree online at Troy University. And offering over seventy online degree options, there are plenty of avenues to choose from. The University of Alabama at Birmingham has long been known as a school that supports dreamers and doers, scientists and artists, in an academically challenging environment that supports student needs and produces leaders across the nation. The school proudly serves a diverse student body from traditional college students to working adults to veteran and military personnel. With affordability as a key focus in addition to academics, the university offers a number of scholarships and financial aid opportunities annually. There are three main delivery types for courses at the University of Alabama at Birmingham online: Programs can be taken fully online, can be taken in a hybrid format where some work takes place online and other work is in the classroom, or in a distance accessible manner where most work is delivered online requiring minimal on-campus visits. Five fully online bachelor degrees are available in Healthcare Management, Industrial Distribution, Information Systems, Management, and Human Resource Management. Additionally, the school offers some fully online Master degrees from the College of Arts and Science, the School of Business, the School of Education, School of Nursing, and many more! The University of Alabama was founded in 1820 and is the largest and oldest public university in the state of Alabama. As the flagship university, the institution is committed to a strong focus nurturing students creatively and academically so they can make a positive difference in their communities locally and around the world. The university boasts cutting-edge research initiatives and state-of-the-art labs, challenging academics, and a qualified faculty. The University of Alabama online is called ‘Bama by Distance and offering degree and non-degree seeking students the chance to enroll in quality academic programs from the comfort of their own homes. Online formats include video conferencing, evening and weekend accessibility, and online access to student services like advisement or library services. Degrees are available fully online in Commerce and Business Administration, the Arts and Sciences, Education, Engineering, Social Work, and many more! Founded in 1835, the University of West Alabama is a public university which began as a church-supported school for young women. Originally called the Livingston Female Academy, today this top institution serves a co-educational, diverse population of students from around the globe. The school is located in Livingston, Alabama and boasts rigorous academics, qualified faculty as leaders in their fields, and affordability. 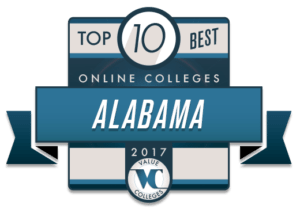 University of West Alabama online offers the same quality academics online as are found on the traditional campus. Students can complete degrees from the bachelor to master levels fully online in areas such as Early Childhood Development, Business, Interdisciplinary Studies, and Education. Jacksonville State University is known for celebrating diversity and promoting leadership across the academic board, both on campus and online. The university cultivates personal development through creative learning and state-of-the-art technologies. JSU offers an affordable education with many students participating in some sort of financial aid annually, including scholarships, grants, loans, and campus employment. The fully and partially online degree programs offered by Jacksonville State University online offer the same student-centered, creative approaches to learning combined with rigorous academics that can be completed on the student’s schedule. Flexibility is important to online learners so coursework is easily accessible and qualified faculty and staff are available to assist distance learners. Some fully online master programs include degrees in Business Administration, Computer Systems and Software Design, Education, Geography, Nursing and many more. The university also offers a handful of fully online bachelor degree programs as well. The University of Alabama at Huntsville is a Tier 1, public university that serves students from all fifty states and over eighty countries from around the world. The school is accredited to award a number of undergraduate and graduate degrees and has been ranked as having the highest Return on Investment (ROI) in the state of Alabama in years past. The University of Alabama at Huntsville is also ranked by Value Colleges as having one the top 50 Best Value Big Data Programs of 2016. The distance learning programs at University of Alabama in Huntsville online offer the same strong ROI as the traditional campus by combining rigorous academic excellence, accessibility, and affordability to students from around the world. Some fully online master degree programs include areas of study such as Business, Education, Nursing, and more, plus a couple of fully online bachelor degree options. The online school is equally fully accredited. Athens State University was founded in 1822 and is a two-year college that today offers over fifty different degree programs, which are led by a qualified and dedicated faculty both on campus and online. Athens State is accredited by the Southern Associate of Colleges and Schools Commission on Colleges to award bachelor and master degrees both on campus and through the online distance learning program. Students enrolled in degree programs through Athens State University online are eligible for financial aid and scholarship opportunities. Some fully online programs offered include a wide variety of master and bachelor degrees in Religious Studies, Education, and Business. The online school also offers professional certificate programs and minors. Judson College was founded in 1838 as a woman’s college and today is a four-year, private Christian college offering degree programs in the liberal arts and sciences. The school still proudly serves a woman-only population and with over 178 years of service to women, boasts a meaningful academic experience for career and service driven female students from around the world. The school is accredited by the Southern Association of Colleges and Schools Commission on Colleges. Judson College online is additionally accredited to offer associate and baccalaureate degrees fully or partially online. Degree programs offered are in the areas of Nursing, Education, Music, and Social Work. Additionally, the online school at Judson College serves a co-educational population from around the world, including traditional college aged students, homeschool students, and working adults or those hoping to further their careers through quality academics. Located in beautiful Florence, Alabama, the University of North Alabama is a four-year, co-educational university and is the state of Alabama’s oldest four-year public university to date. The university is a leader in offering one of the best programs in Education across the state and offers accredited undergraduate and graduate career driven degrees in Education and other fields of study. The distance learning programs at the University of North Alabama online offer the same quality education as is found on the traditional campus online and is accredited to award both undergraduate and graduate degrees in a number of areas. Some fully online master programs include degrees in Education, Criminal Justice, and Art History, plus the University of North Alabama online offers bachelor degrees in Nursing, Sociology, and more. Alabama State University was founded in 1867 and is a Historically Black University. The institution is located in Montgomery, Alabama and carries the legacy of the rich African American histories found in the city. Originally the school was located in Marion, Alabama and known as the Lincoln Normal School. At its founding, the school was opened with $500 raised by nine freed slaves who are known today as the Marion Nine and remembered for their leadership, determination, and perseverance. Because of the Marion Nine’s dedication to educating African Americans, Alabama State University is the oldest institution of higher education founded for black Americans in the nation. Today the school boasts quality, focused, and rigorous academic opportunities for students from around the globe blended with a personal student attention and mentoring. The online programs at Alabama State University online offer the same quality education paired with personal attention as is found on the traditional campus. Students have the flexibility to complete their coursework at their own pace and on their own schedule. Currently Alabama State University offers four graduate programs fully online.